Expand Social Security. Don’t cut it. They knew that Social Security was about economics, but it was also about our values. It’s about who we are as a people, and what kind of country we are determined to build. Today Social Security is under attack. The Republicans are doing everything they can to privatize and cut benefits for millions of seniors who rely on Social Security to keep food on the table and a roof over their heads. Join me today – on the 80th birthday of Social Security – to take a stand: We believe in protecting and expanding Social Security so our seniors can retire with dignity. Social Security is about independence and dignity. It’s no surprise that 79% of likely voters in last year’s election – Democrats, Republicans, and Independents – support increasing Social Security benefits. Every person who represents you in Washington, and every person running for President in 2016, should be talking about protecting and expanding Social Security – not cutting it. 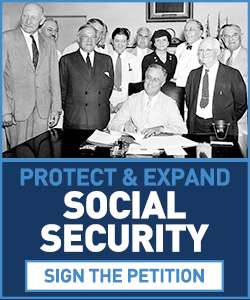 Let’s take a stand for America’s seniors: Sign our petition to protect and expand Social Security so that, when the time comes, every person can retire with dignity.